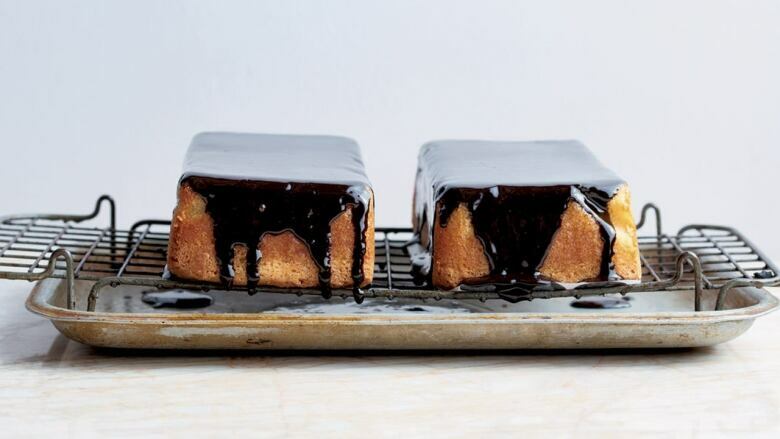 From Yotam Ottolenghi and Helen Goh’s, ‘Sweet’, expect this coconut-laced cake to be amazing, of course. With its coconut-laced base and uber-rich icing, this cake is sure to quell all your fears about gluten-free desserts and become your new go-to. There’s something about a cake showcasing its flourlessness or gluten-free nature that can often make it sound a little bit lacking. Unfairly so, in a case like this, where the feeling of eating it is the very opposite of “free from”; it’s utterly buttery and decadent. Preheat the oven to 350 degrees F. Grease the base and sides of a standard 8 ½ x 4 ½ inch loaf pan or a 9 inch round springform pan and line with parchment paper, then set aside. To make the water ganache when you are ready to serve, place the chocolate in a medium bowl and set aside. Put the sugar and corn syrup in a small saucepan and place over medium-low heat. Stir to combine and, when the sugar has melted, increase the heat to medium and bring to a boil, stirring gently from time to time. Continue to boil for about 7 minutes, until the color is a pale amber. Remove from the heat and carefully pour in the water. Don’t worry if the mix seizes; just return the pan to the heat, add the vanilla seeds and stir gently and continuously until it returns to a boil and the sugar has melted again. Remove from the heat and wait for a minute before pouring the water-caramel over the chocolate. Allow to stand for about 3 minutes, then whisk to combine. Add the butter, a couple of cubes at a time, whisking after each addition. Continue until all the butter has been added, whisking to combine until the consistency is that of thick syrup. Note: This cake will keep well for up to 5 days in an airtight container. It can be eaten on the day of making, but we think it tastes even better served at room temperature the following day.